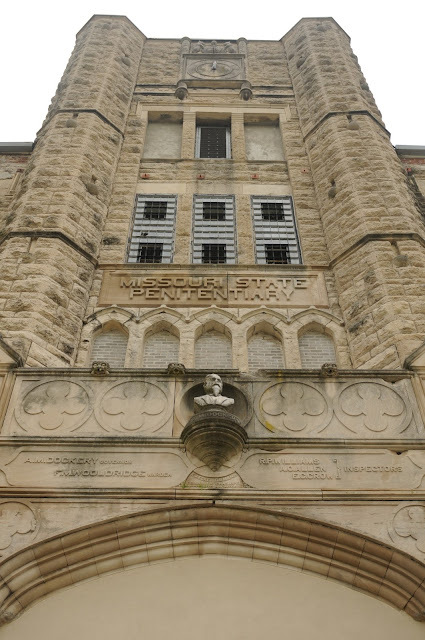 Last month, we had a free Sunday and decided to go back to Jefferson City to get some of that amazing beer bread at Prison Brews (it's still amazing) and to check out the daytime history tour at the old state penitentiary. You may remember last year's visit when we did the night time paranormal tour. I don't want to repeat a lot of shots, so go look at that one, and then come back. Ready? OK. So first of all, let me just say that the paranormal tour is great, especially if you like ghost stories and/or believe in ghosts. You do get lots and lots of history, and every guide clearly has different stories they like to tell. 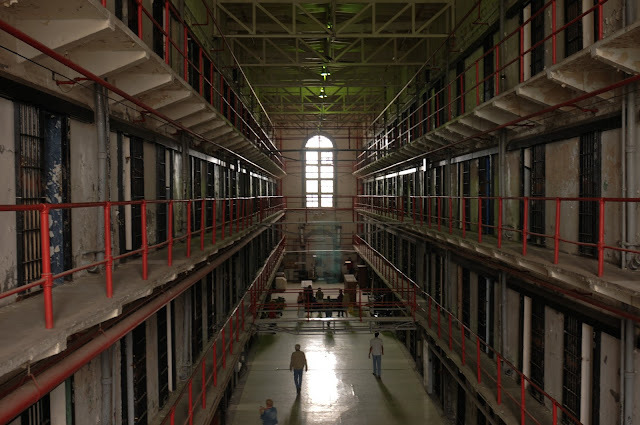 That said, our daytime history tour guide was Green, who worked at the prison as a guard for 30 years. Green has some stories, man. Green will show you a bath towel full of shanks. 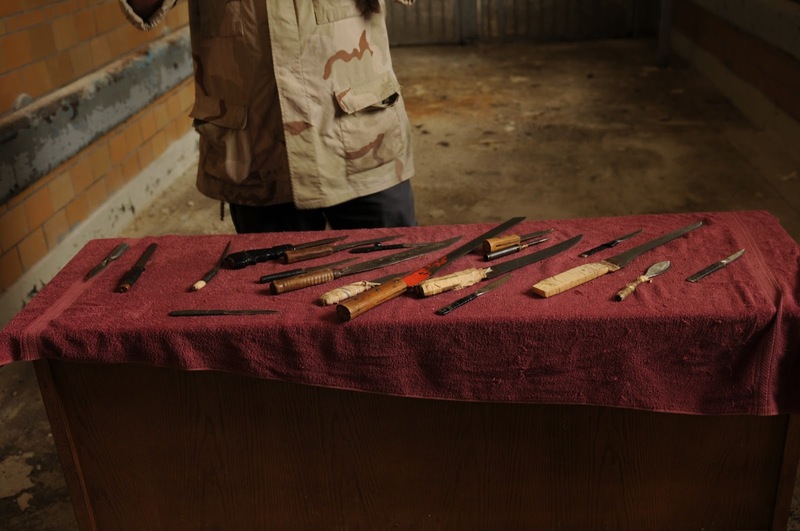 Green does a pretty startling demonstration of where these weapons can be hidden and how they are used. He's an excellent story teller and tour guide, right up there with Dennis and Dennis. 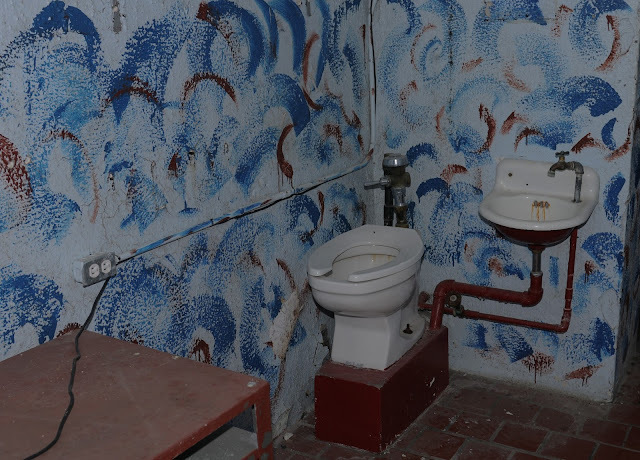 Since we had been in this building before and knew that the prisoners were allowed to decorate their cells, we went searching for some of the uniquely painted ones. There's a great book available at the prison gift shop called Shanks to Shakers: Reflections on Missouri State Penitentiary that is full of pictures of some of these cells, as well as the prison weapons and other contraband that was confiscated. It is freaking fascinating what can be turned into a weapon. I highly recommend the book, which you can buy from the MSP online gift shop. I mentioned the dungeon in my last post but didn't post any pictures. 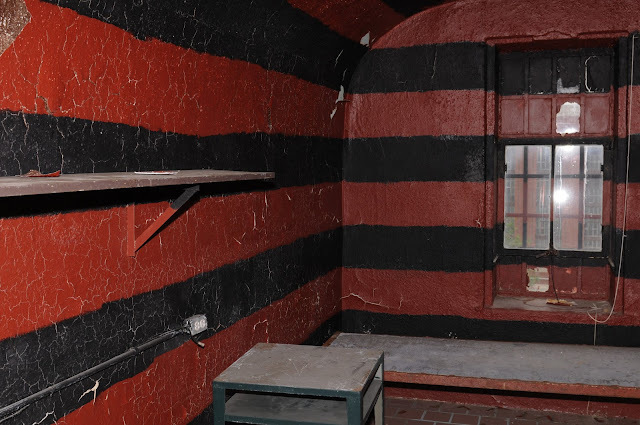 This was the solitary to end all solitary, where prisoners were kept in total darkness for years. 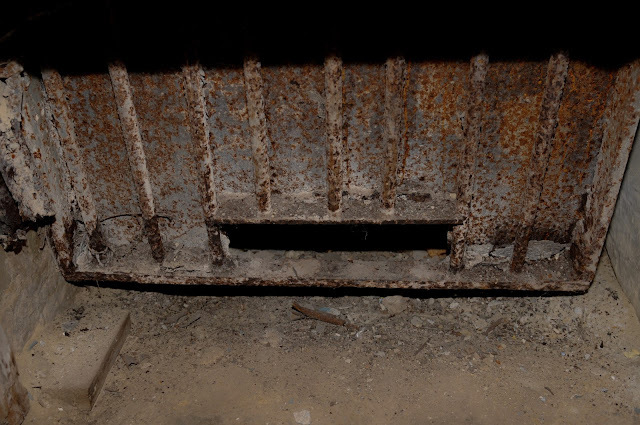 We got to explore a little more this time, and Francis got this picture of one of the excavated cell doors. Below is another that is solid metal. Notice the slot for food (delivered occasionally) at floor level. Solitary can drive a person crazy. Sometimes they would take a button off their shirt and toss it in the dark and then hunt for it, just to keep their brain occupied. People still do this, you know. 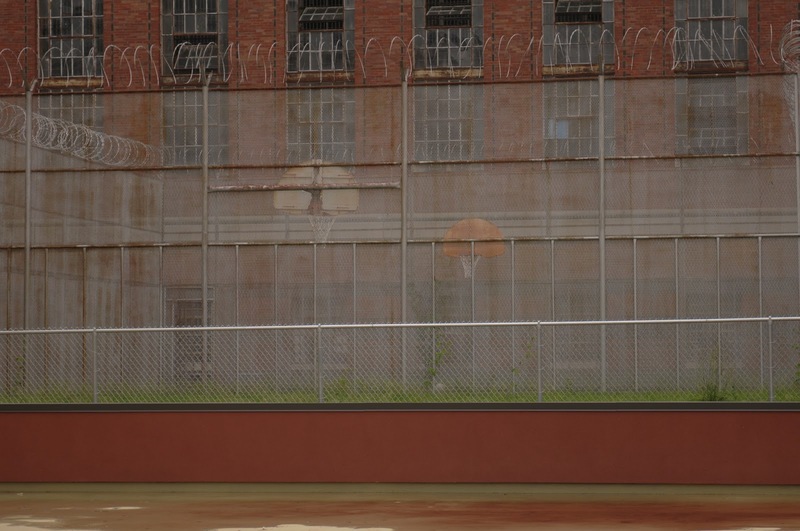 I read an article about the US prison system and solitary confinement the other day, and one prisoner was quoted as saying that one of his first thoughts is, "Do I have something round to toss?" The final stop is the gas chamber, which you have to drive around the block to visit. Since we took a lot of pictures of the gas chamber the last time, this time we wandered over to the exercise yard. All this space used to be exercise yards and a baseball diamond before it was turned into a parking lot for DoJ employees. Back in the day, they'd even have Little League games here. 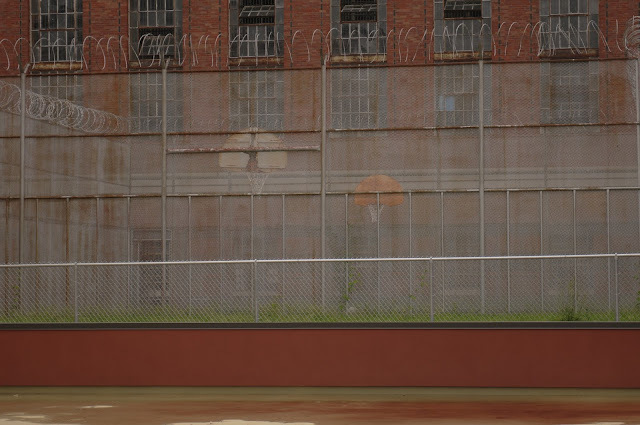 IN THE PRISON. Can you imagine? This is where the famous boxer, Sonny Liston, learned to box, too. 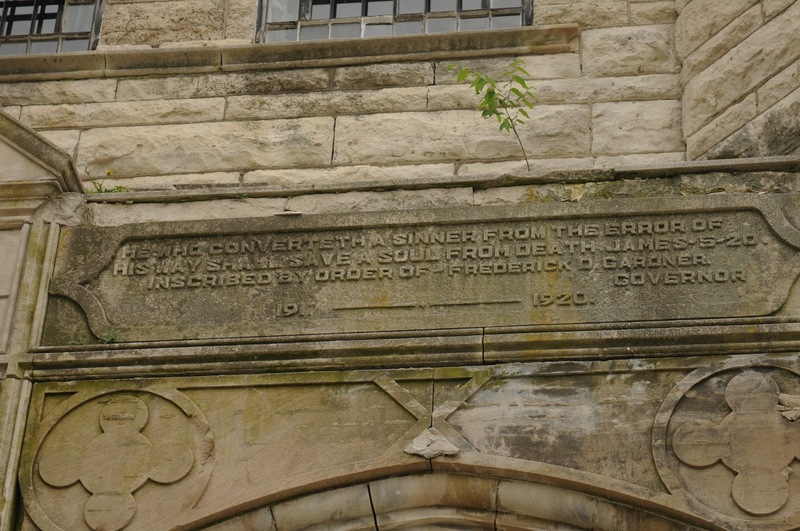 You can read about him and other famous (and infamous) inmates on the Missouri State Penitentiary website. One thing Green didn't really talk about was the riot of 1954, which I mentioned in last year's entry, one of the all time most popular on this site.There are some great pictures from the night of the riot in the Shanks to Shakers book, and I also found this article written by a former inmate: In the Wake of a Riot. I hope you enjoyed our second virtual tour of Missouri State Penitentiary! Jefferson City is an easy day trip from most towns in Missouri, so I hope you will visit missouripentours.com soon to book a tour of your own! They also recently opened a museum in town, and we'll be back to check that out later this summer.